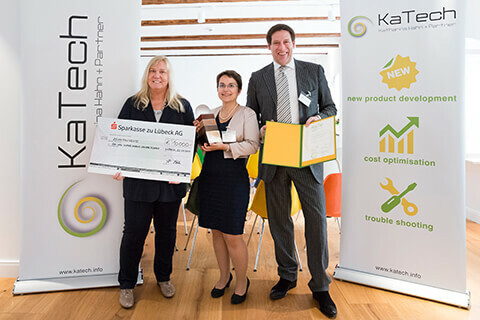 The food technology company KaTech Katharina Hahn + Partner GmbH has awarded the „KaTe” prize for pioneering food research for the first time. Dr.-Ing. Ulrike Sabine van der Schaaf from the Karlsruhe Institute of Technology (KIT) received the prize for her work on the emulsifying and emulsion stabilising properties of Citrus Pectin. This hydrocolloid, coming from renewable resources, can increase the availability of natural, plant-based emulsifiers for food products in the future. 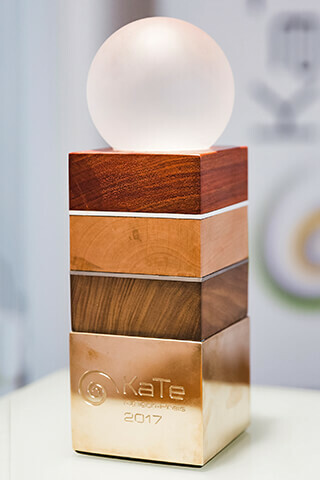 With the KaTech-prize the company wants to reward young scientists for their commitment and research on ecological and social sustainability in food. It has been awarded in 2017 for the first time with a prize money of 10.000€. The board of trustees consisted of eminent personalities from the world of science together with the technical director of the company. From now on outstanding research projects will be awarded every three years. Nutrition has always been one of the major concerns to the world. More than ever, there is a strong, worldwide demand for healthy and sustainable products. Producers as well as the food processing industry and their suppliers need to take responsibility and find solutions for the future. KaTech Katharina Hahn + Partner GmbH is contributing by awarding the prize „KaTech” to support outstanding food research projects. The Hahn family has a long history in food. As early as 1844, Georg Carl Hahn brought a new way of food preservation to market – at that time a completely new process in Germany. Today, more than 160 years later, Katharina Hahn is looking to breaking new ground once more. Since its market entrance in 2012, KaTech has grown into a well-respected specialist for food technology solutions especially for Organic, vegetarian and vegan products. The company is supplying customers all over the world.